As the first Democrat to be elected as recorder in Maricopa County in decades, Adrian Fontes has also served as a punching bag for Republicans, for reasons both legitimate and political. As Arizona clawed its way out of the Great Recession, Gov. 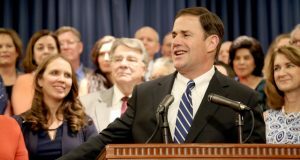 Doug Ducey sought to ease the state’s reliance on borrowing and gimmicks to balance the budget.